Description: Burning House Of Love 12" Promo Single. Signed by John Doe in green paint pen. LP not included! Personalized to TREES. 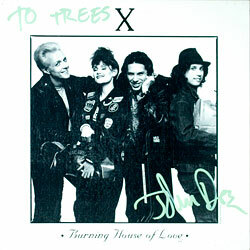 Note: Item signed on X's 1992 US tour at TREES in Dallas Texas. Description: 16" Remo Drum Head Signed by complete 1989 touring band. Signed in red paint pens. 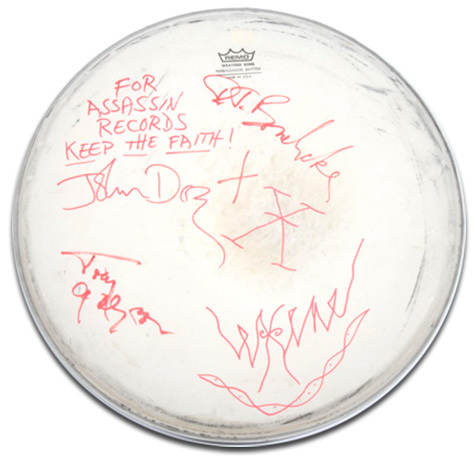 Drum head used at the show. Personalized to Assassin Records. Note: Item signed backstage at the Bronco Bowl Arena in Dallas, TX whole on their 1989 US tour.